This sign used to say FRESH AVOCADO. But for several years, it’s said something more like FRE SH AVOCA DO. I’m not 100% certain, but I think they may have actually moved the SH further from FRE and toward AVOCADO a few times…and now they’ve finally just added another E.
After I posted it to Instagram, a friend on Tumblr pointed out that the #Free Shavocado tag already exists. 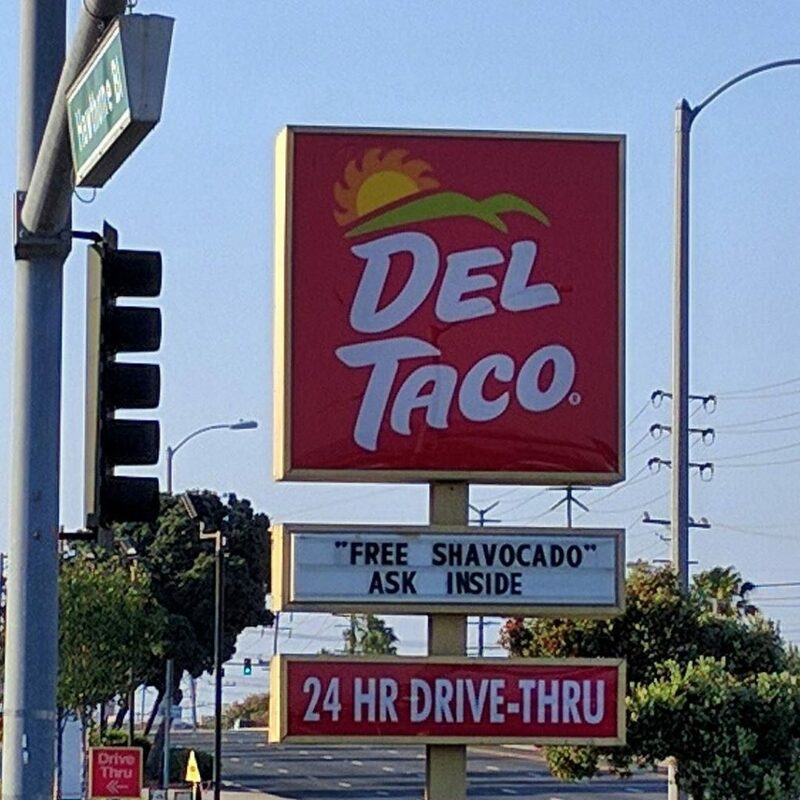 I found a short video of the sign in its “FRE SH AVOCA DO” state, narrated by someone giggling and saying, “Come to Del Taco! They have free sha-VA-ca-doo!” Even funnier: The restaurant updated the corporate sign between then and now without correcting the spacing. Or maybe that’s when they decided to “fix” the spelling instead! This entry was posted in Food, Highlights, Signs of the Times and tagged Avocado, Free Shavocado, Torrance on June 26, 2016 by Kelson. It lasted most of the summer, but they finally redid the sign. I drove past it a few days ago and it said something ordinary about a new burrito or taco or something.